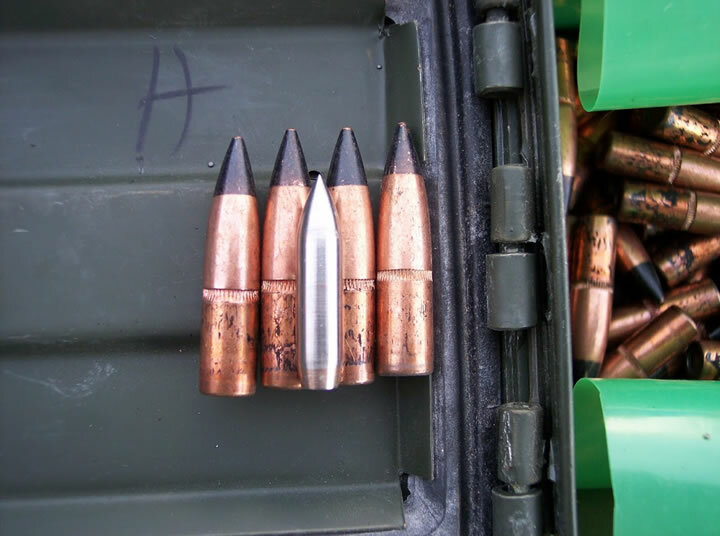 30-06 Reminton M2 Armor piercing 163 grain tips. Centerless ground cores. 1944 production. These are rare and in excellent condition with no pull marks. We collet pulled these tips about 10 years ago. Unlike most M2-AP, these have centerless ground cores not machined cores. The benefit is that the cores are very consistant in weight and dimensions. This process takes much longer to produce cores and is rarely used. We also noticed the canalures are different than all other M2-AP tips canalures. It is a rolled type instead of a cut canalure.These tips have a hardened steel core but we have not done a core hardness test to get specific Rockwell C. We have other AP tips in stock call for pricing.